It is looking as if this is to be the year of the camellia for us. We went to China in February, to join the International Camellia Society’s biennial congress and it has been non-stop camellias since. While the congress in Dali was wall to wall reticulatas (more on these in my August NZ Gardener column), one New Zealand cultivar has made inroads to the heady world of Chinese camellias where they otherwise show complete loyalty to their own. The late Jim Findlay from Whangarei spent many years working on scented camellias and it would not be exaggerating to say that his ‘High Fragrance’ is a sensation in China – regarded with reverence, even. It is a shame Jim is not still around to enjoy the accolades and honour from the home of camellias. Dali prides itself on being camellia heartland. Even aside from the colourful displays and ceremonies associated with hosting what was seen as a highly prestigious congress, it was clear that the camellia is a cultural icon unmatched by anything I can think of in New Zealand, except perhaps rugby. It was celebrated in song, dance, art, branding, decoration and, above all else, in plants by the thousand, nay, tens of thousands, grown in containers and displayed everywhere. Travelling across hemispheres, we arrived home in early March to find our earliest camellias already in bloom. C. sinensis is the proper tea camellia and one form we have has the daintiest and earliest little pink blooms. It is, of course, primarily grown for its young foliage which we sometimes harvest for the freshest green tea experience possible. Lightly crushing the leaves and leaving them to ferment overnight in a warm place gives a stronger flavour, reminiscent even of our favoured Earl Grey. Inspired by our Chinese experience, I am determined to be more organised and consistent in harvesting the foliage in spring this year though we are not going to reach self sufficiency. 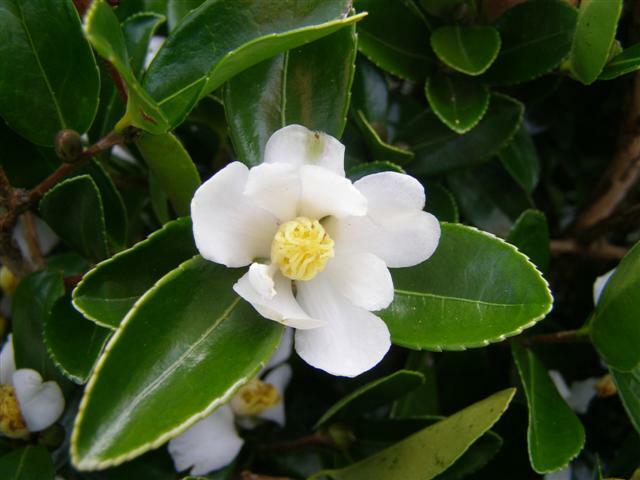 The other very early bloomer for us is Camellia brevistyla, with its dainty white flowers. It is a bit ephemeral with its flowering season (the extremely similar C. microphylla lasts longer) but its small leafed, compact form lends it to clipping so we are happy to let it keep its little space in the garden. By mid May and into June, it is the sasanqua camellias that take centre stage as the dominant flowering shrubs in the garden. 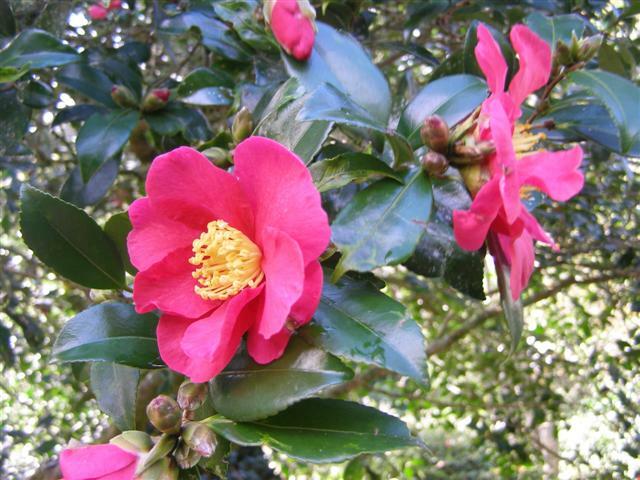 Most of the sasanqua species originated in Japan and in the camellia heydays through to the early 1990s, they were often seen as the utility relative – good for hedging and sun tolerant but lacking the substance and flower form that were prized in the japonicas and hybrids. Fashions change with time and these days I really like the softer flower form and the smaller foliage which is usually a good dark green colour and ideal for clipping and shaping. Also, the early bloomers of the season lift the spirits on grey days of late autumn going into winter. The other huge bonus of the sasanquas is that they do not get petal blight which has cut the display of later flowering types. The ravages of petal blight (technically Ciborinia camelliae) have been a huge disappointment to us and pretty much stopped the inter-generational Jury camellia breeding programme in mid stride. It was particularly interesting in China to see blight and discuss it with professionals from other countries. Australia is still free from it (a good argument for tight border control), but Asia, Europe and the USA are all afflicted. I spoke to an Italian researcher who gave hope. They have found a biological cure (another fungus, in fact) which is working well in laboratory conditions but not yet in the field (or garden). Maybe over time, there is light at the end of the blighted tunnel. In the meantime, what struck us was that while we saw it through the areas of China we visited and discussed it with Europeans, it was nowhere near as bad as we get here at home. Mark ruefully commented that maybe we have the worst blight in the world. While our coastal Taranaki winters are mild and we get bright sun, we also get a lot of rain and high humidity – optimum conditions for anything fungal, really. China was dry. Maybe gardeners in dry parts of New Zealand like Hawkes Bay and Central Otago are correspondingly less affected? Camellias continue to play a valued role in our garden but the nature of that role has changed in response to wretched blight. First published in the June issue of NZ Gardener and reprinted here with their permission. 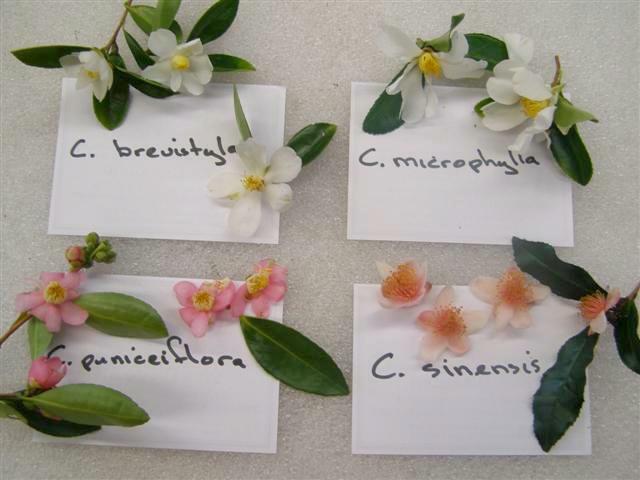 This entry was posted in Abbie's column and tagged Abbie Jury, Camellia brevistyla, Camellia High Fragrance, camellia petal blight, Camellia sinensis, International Camellia Congress in Dali, sasanqua camellias, Tikorangi: The Jury garden on 5 June 2016 by Abbie Jury. 1) April 9, 2010 Our chaenomeles never get bletted – Abbie’s column. 2) April 9, 2010 Autumn is the best planting time here for the ornamental garden – garden tasks this week. 3) April 7, 2010 Summer has hardly waved goodbye but it must be autumn – the early camellias are in flower. Camellia brevistyla. 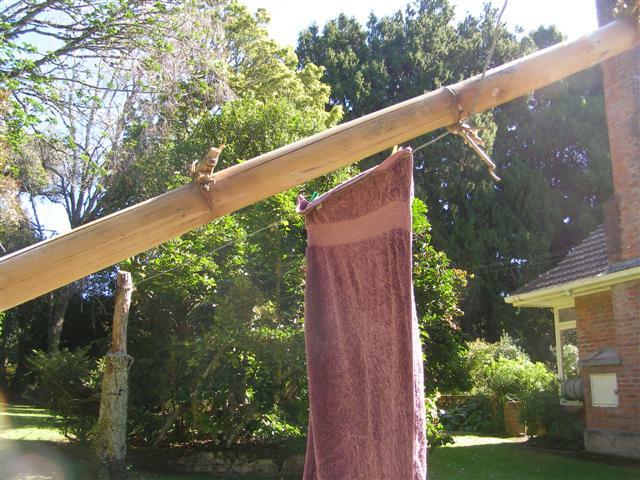 You wouldn’t credit how pleased I am with my new clothesline prop. While 95% of this country favours the rotary clothesline (originally styled the Hill’s Hoist, I am told), I quite like the nostalgia of the one wire strung between a dead tree trunk and another that looks as if it may be on the way out. This wire has served the house inhabitants well for 60 years and who am I to change traditions? The bamboo prop, however, requires replacement every five years or so. Fortunately we have a stand of this giant clumping variety on a small island in our park. 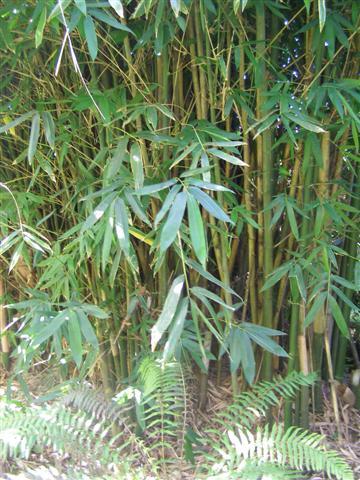 Mark says he thinks this particular bamboo is one of the dendrocalamus family. There has been some resistance here to the suggestion that we could follow Asian traditions and build our own bamboo scaffolding when the upper story of the house next requires painting. The do-it-yourself ethos does not extend quite that far. This entry was posted in Tikorangi notes and tagged autumn planting, Camellia brevistyla, chaenomeles, giant bamboo on 9 April 2010 by Abbie Jury.